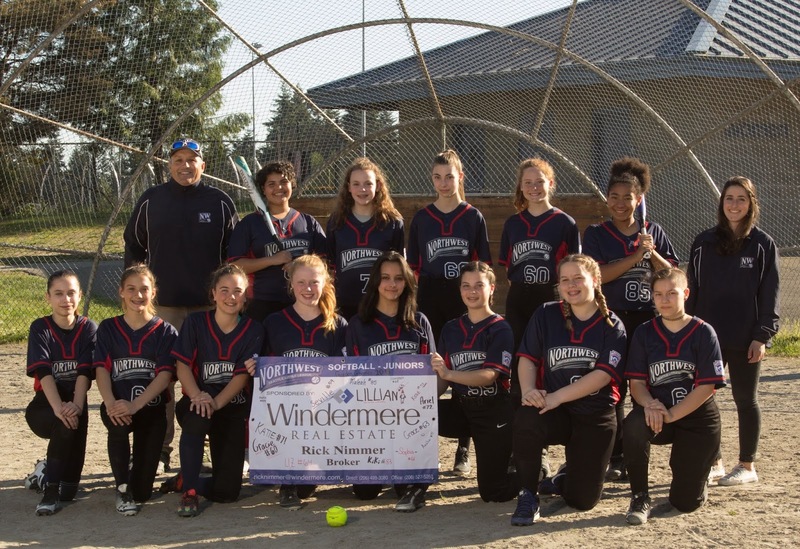 The Northwest Seattle / Shoreline Little League Windermere Rick Nimmer Garden Gnomes Juniors Softball team has earned a spot to play in the District 8 Championship game held at UW Husky Softball Stadium on Wednesday June 13th. This team is 13-3 on the season. They finished the regular season on a strong note, winning their final regular season game over Ballard/ Magnolia/ Queen Anne Little League team. In their first game in the D8 Tournament they defeated North Central Little League 7-4 moving on to face Northeast Little League who had a bye in the first round. The Garden Gnomes got off to a rough start against Northeast Little League, giving up 4 runs in the first inning and not being able to fight their way back, losing 6-1. With this loss they now had to play in the losers bracket of the double elimination tournament. Facing a tough task ahead, the Gnomes would need to win 3 games in a row to make it to the Championship. The Gnomes' next opponent would be Ballard/ Magnolia/ Queen Anne Little League with the Gnomes getting the win and their starting pitcher threw a no hitter. The Garden Gnomes would then move on to face North Central Little League in an elimination game. This was a well played game all around with great pitching, defense, and hitting, allowing the Gnomes to get the win and stay alive in the tournament. This earned the Gnomes a spot in the Semifinal match up against North Bothell Little League, played at Shorewood High School. The NW/Shoreline Garden Gnomes got off to an amazing start with 6 runs in the first inning and never letting up and winning the game in 4 innings and earning a spot in the District 8 Championship game at UW Husky Stadium. The Garden Gnomes are no strangers to tournament play and success. This team went undefeated in the 2017 Majors Softball D8 Tournament, winning the District 8 City Championship over Northeast Little League, and losing to Woodinville in the District 8 Championship at UW Husky Softball Stadium. In 2015 while playing in the Minor Softball Division they had similar success going undefeated in tournament play, losing to North Central Little League in the City Championship game at UW Husky Softball Stadium. This will be the Garden Gnomes' third visit to the Championship game at UW Husky Softball Stadium in the past four seasons. They have had an incredible run of success which has created some great rivalries amongst other D8 opponents. Most notably Northeast Seattle Little League who they were able to beat in both semifinal games in 2015 and 2017 keeping them from making it to Husky Stadium. The Championship game in 2018 will be loaded with excitement, pitting the Northwest Seattle/ Shoreline Juniors Softball Garden Gnomes against the Northeast Junior Softball Little League squad. These teams know each other well, splitting the regular season series, and losing to them in game 2 of the 2018 tournament. This will be a hard fought game and the winner will more than likely be the team that makes the fewest mistakes. The Northwest/Shoreline Little League Garden Gnome Team is Managed by Rick Nimmer, and coached by Stephanie Saunders, Ashley Swan, and Kari Fera. The Garden Gnomes would like to thank Tracy Lemke, President Of Northwest Little League, Dean Barth, President Of Shoreline Little League, Mickey Telling, Vice President of Softball Shoreline Little League, and all of the great families and fans for their support in the 2018 season. District 8 Little League is made up of teams from Ballard, Magnolia, Queen Anne, Roosevelt, University District, Greenlake, North Central Seattle, Northeast Seattle, Northwest Seattle, Shoreline, North Bothell, North Lake, Northshore, and Woodinville. The Little League Juniors Softball Division is made up of players 13 and 14 years of age with most in 7th and 8th grades. Many of these players will be starting High School next year and will attend Shorewood, Shorecrest, Ingraham, and Nathan Hale. The District 8 Little League Juniors Softball Championship will be played at UW Husky Softball Stadium Wednesday June 13, 2018 at 7:30pm. This event is free to the general public. Go GNOMES!! Auntie Tara is rootin' for ya Marissa!! Go, Gnomes! I know you can do it!